After living in Manhattan for decades, the owners sought to trade the confines of city living for a site with sweeping views of the Hudson River. They wanted a compact home that was as extraordinary as the vista it offered, equipped with just enough space for two. The site is entered via a winding gravel drive through meadow grasses and lilacs up to a framed view of the Hudson River through the carport. The lightness and reflectivity of the façade enhance the reading of a hovering volume in the sky, resting on just a few thin steel columns. Located on one of Croton-on-Hudson’s highest overlooks, the house was conceived around maximizing panoramic views of the town and river below via floor-to-ceiling windows across the façade. Meanwhile clerestory windows along the front maintain privacy from the drive, while providing natural daylight. The slatted ipe volume contains a stair and elevator to the main level. The living space is open and airy – fitting for a house floating in the trees. A long kitchen island and low cabinetry near the built-in banquette provide ample storage while maintaining sight lines to the landscape. The interior palette of white oak and light grey provides a muted backdrop to highlight select pieces from the owner’s pottery collection. The master suite has built-in wardrobes flanking either side in lieu of a master closet to maximize space. The built-in bed conceals a TV on a lift mechanism, so it can be hidden when not in use, preserving the view through the full height windows. With the bath open to the bedroom, the couple can get glimpses of the water from the vanity. The home office, serving as a threshold to the guest bedroom, offers additional views when seated at the built-in desk. The guest room features a murphy bed, so it can be used as additional living space when unoccupied. A covered central deck, enclosed on three sides, can transform into a seasonal outdoor room with a firepit and drop-down insect screens. Below, a long lap pool and deck provide shade while exercising or lounging in the water. Metals panels on the underside bounce light and reflections from the pool water below. The exterior materials were chosen for durability and longevity - metal paneling, untreated ipe, and pvc - guaranteeing that minimal maintenance is required. 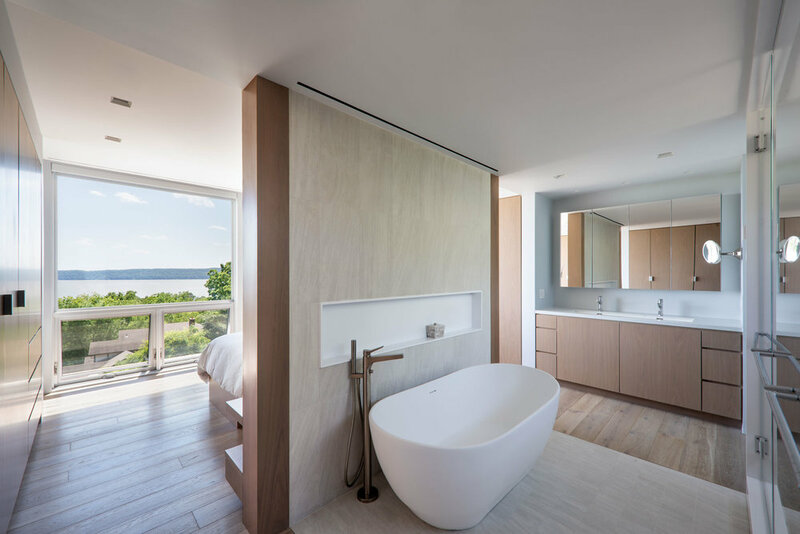 The Hudson River House’s simple form, extensive glazing, and subdue material palette reinforce the project’s initial goal - prioritizing the stunning natural landscape.